Lisa Wingate is a powerful storyteller. In every book, she engulfs the reader and transports them through time and space to the very heart of her story. 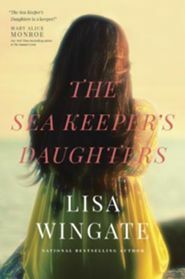 The Sea Keeper’s Daughters is no exception. It’s a compelling book that is not only a page turner in a great storyline but one that will bring tears to the reader eyes. Already a huge fan of Lisa Wingate, I can say that I am never disappointed in her books and always thrilled when a new one is released. I had the incredible privilege of reading this book in an Advanced Reader Copy from Tyndale House Publishers on Edelweiss. This book follows The Story Keeper but can easily be read out of order. Money is tight and with the second restaurant’s issues, Whitney is doing all she can to be everything to everyone and failing miserably. Denise, her business partner and cousin, is the only family she can count on and she’s determined not to let her down. Whitney answers the call to help her stepfather with intentions on reclaiming what was hers and fixing the issues with the restaurant. Making the trip from Michigan to North Carolina, Whitney arrives at the Excelsior Hotel, her grandmother’s home and Whitney’s childhood summer location. Although it offers no great memories of her grandmother, Whitney finds the memories of her mother there suffocating. She also finds her cantankerous stepfather pretty much where she left him all those years ago. The Sea Keeper’s Daughters is written with such powerful quotes. Thought provoking, enticing and empowering, it leaves the reader wanting more yet satisfied with the power of fantastic storytelling. It deserves without a doubt, a five out of five star rating! Wow, sounds like an excellent book! The comment “acceptance was soft. It lets everything in, including the pain” hit me right between the eyes. Sometimes I can’t understand my own struggles with acceptance. This one sentence answers that question.